Harmony Road Studio: Where have you been? Hello friends and family. I have not dropped off the face of the earth but taken a blog breather so to speak. I have been keeping busy, and ,watching the Olympics in my country is very exciting. Hubby has been home now 1 week since being layed off and although we don't really mind one another I have found my daily routine a bit thrown off but in time I will just keep doing my thing and he can find something to occupy himself. We do have some things around here that we can do but lets not hurry into those right away. I would rather play with paper and paint than do those house things. I did paint these 2 items for my Mother. She was away for a couple of weeks and she has since seen these so now I can show you. 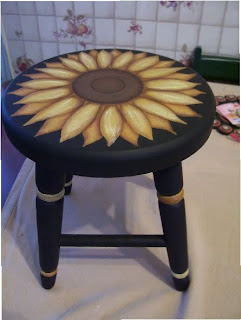 The stool was a green colour with a lot of stroke work on it, not my favourite painting technique but it was time for a facelift. 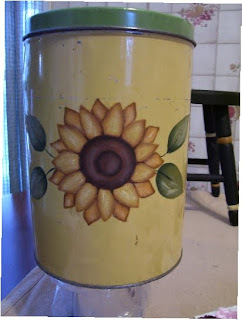 The cannister is an old tin cannister and because these 2 items are going into her kitchen I did sunflowers on both. These are Gail Anderson patterns and I quite enjoyed painting my most favourite flowers. I felt light and cheery while painting these during these long winter days. I am not really a depressed type but just feeling a little cabin fever and just wishing for warmer weather to arrive. The way our winter has been and not a lot of snow, I would love to anticipate an early spring but that means possibly rain leaching into the basement or quick thaws and we know how Lesley get's kind of ugly when that happens. I have also made some very wonderul papers that I learned to make from a tutorial that was posted on our ATC for Beginners board last month. It was such a hit and we all made ATC's and sent a finished card and some of our papers to each other. The combinations of colours and textures were amazing. I just used brown paper lunch bags and cut the bottoms off then wet the paper, crumpled it, then with my brayer I layed down the colour on the wet paper, then added another colour then gold paint and some embossing powder for some glitz. I just love this paper and now I have quite a bit of it on hand to use for greeting cards and ATC's. In a day or so I will post some ATC's I made with my Glorious Brayered Paper ( or GBP as we have been calling it). Speaking of greeting cards, if you recall back in January I posted that I was setting up a personal challenge of a greeting card a day for the following year and to date I have approximately 66 cards made. What I am doing is making a few cards in a sitting because I have such limited crafting space and have to haul things out and put them away constantly ,soooo I make a few or a lot at once, then I go onto to other things and another day will do cards. I will show you a pic I promise , I haven't forgotten. Here is the stool and the cannister and I will say good night and thanks for dropping by. Hey everyone needs a breather. I do love the canister and stool. Beautiful work.